Okay kids, how fun is this? It’s fun on both fronts: the creamy chicken pot pie soup made in the slow cooker (with heart puff pastries! adorable!) AND this new thing we did this month and it’s called the Reader Recipe, which is exactly like it sounds: recipes from readers! This month our winning submission was from Clancy! It’s creamy, savory, and totally WINTER COMFORT FOOD which was exactly what we asked for from our submissions. 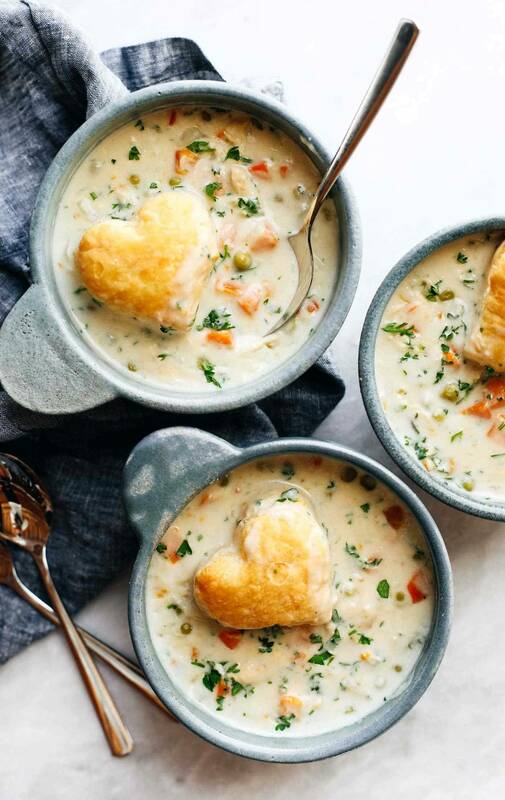 She recommended a Chicken Pot Pie Soup recipe to us, and while I was excited about the creamy chicken, the veggies, the herbs and potatoes and all that, the thing that really got me excited was, hate to say it, but the HEART SHAPED PUFFS on top! These are the very important life things that win me over. Making Clancy’s recipe in our studio kitchen was so much fun. If you want to submit something for our March Reader Recipe, check for instructions at the end of the post! Slow Cooker Chicken Pot Pie Soup – low maintenance creamy winter comfort food, made from scratch! Slow Cook: Place the chicken, salt and pepper, onion, garlic, rosemary, thyme, broth, potato, and pea/carrot mix in a slow cooker. Cook on high for 3 hours. Remove the chicken, shred, and return to pot. Remove the herb sprigs and discard. Make it Creamy: Whisk the flour and cream together until smooth. Add to the slow cooker. Keep on high heat for another hour or so. For a thicker soup, whisk the cornstarch with a little bit of cold water and add it to warm soup in the slow cooker. Bake the Puff Toppers: Cut your puff pastry into triangles, circles, or hearts! Bake as directed (we did 375 for 10-15 minutes). Serve: Stir the parsley into the soup to add a little fresh color. Divide the soup among bowls and top with the puff pastry. Yummy! If you wanted to get the best possible color for your peas, I would chop up some fresh carrots and put those in right away, and just add your frozen peas at the end. For best results, warm the cream before you add it to the crockpot. This helps the cornstarch activate and thicken the soup more quickly. Clancy’s original recipe didn’t call for cornstarch, and you could definitely make it without. But I added it because I wanted it to be super thick and creamy like pot pie gravy filling! Hey friend. Do YOU have a great recipe that you think we should try? TELL US ABOUT IT. This month our theme is salads! Like, actually yum-o salads. Green salads, grain salads, chicken salads, fruit salads, noodle salads… all of em. You can submit your March salad recipe by clicking HERE. Submissions are now closed. Sounds like 4 hour cook time when adding the cream and cooking for an additional hour, instead of 3 hours. Probably just a typo! Thanks for the catch! Just updated that. Are you supppse to add chicken broth as well? It was in the ingredients. Yep! Broth is listed in step 1. 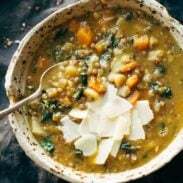 Have you ever frozen this soup? I am in freezer meal swap and I’d love to make this for the group. It should freeze okay! I’ve found that some cream-based soups can separate when reheated, but you could always just make a little roux to cream it up again. This is so close to my favorite recipe, that it’s scary! In addition to the rosemary & thyme, I add parsley (personal family preference), and sliced celery. When I was in my 20’s (50 years ago), I loved them so much that I cooked two, and literally took one and grabbed out each separate ingredient. Then figured proportions, added (at the time) canned mushrooms. I wonder if they even still sell canned mushrooms!?! It has been a favorite with my family & myself, all these years. Oh, occasionally, I add some white wine. Hmmm!!! Just remember, if you wouldn’t drink it (quality wise), don’t cook with it! This sounds delicious and just in time for our cold, cold temps. We love chicken pot pies. This maybe a little healthier. I think this might be in the crock pot for supper. Yum! Yup. Yup. SO agree! I would love to be able to freeze this too. I wasn’t even going to leave a comment until I saw those pantry hearts on top….oh swoon my heart! Making this as soon as my new crackpot (sticking autocorrect, Crockpot….I’m the crackpot) comes from Amazon! Congrats to Clancy! I was following this on Instagram. Such a great recipe. Thanks for sharing! O.M.G.! This looks sooooooo awesome! Eddie would love it too! This looks sooo good, I think I have to make this tonight! Even if it is 81 degrees today down here in Florida! I’m sure my kids would love this as well. I also think it was a good idea to add the cornstarch, as I too love thicker soups. I may even throw some gnocchi in, since I can’t get enough of it these days. Thanks for the great recipe, Clancy and Linsday! Ah 81 degrees sounds amazing to these Minnesotans! 🙂 Hope you enjoy it! Do you think there could be a substitute for the heavy cream if one is sensitive to dairy? Hmmm nothing comes to mind that would be as thick/high fat, but you could sure give a non-dairy milk a try (non-sweetened almond, soy, etc). I know it’s not dairy free, but when recipes call for cream, I usually use Carnation brand evaporated milk as well as a little more cornstarch. I’ve had success using canned full-fat coconut milk in place of heavy cream in other creamy soup recipes! Really? It won’t add a coconutty flavor to the soups? This looks so creamy and delicious! I am loving those heart pastries, such a great idea. So darn cute!!! Right!? They are seriously the best. What time/setting do you recommend for making this in the instant pot? We haven’t tried it so can’t say for sure, but we’d do the same process and cook 10-15 mins on manual (just for the chicken to cook through). It’s chilly and rainy here in PA and I wish I had a bowl of this right now! It is SO perfect for a rainy day! Looks so easy. Thanks for sharing. This looks super yummy! Such a great satisfaction when i try your recipes and succeed:) Thank you so much for sharing this. Awwww, those heart pastries are adorbs. ADORBS! That soup looks baller too! I want some! Pinning! Hope you enjoy it, Christina! Crushing on your Smead refrigerator in the background. Is the chicken cooked or raw when it goes into the pot for three hours? Lovely recipe. Is there a a link I’m missing to the gal who submitted it? Would love to try more of her recipes! Is the chicken going in raw? made this vegetarian and it turned out delish! sub’d vegetable broth instead of chicken broth and tofu instead of chicken. made it on the stove top too. i’m guessing i may have missed the melding of the ingredients since not in a crock pot but good none the less! Glad to hear that, Kathy! Dear Lindsay, thank you for all of your efforts in sharing delicious recipes. Those I have attempted have been wonderful and encourage me to cook homemade food more often. You are a beautiful person inside and out. Thank you for blessing my life (& my husband’s). I made this tonight and it’s really good, except I wanted my a little more thicker, but if i’d cook it longer, my frozen peas would turn to mush. Oh well, still delicious. I won’t make that mistake again. This looks so good! I need to try this! !